We made our Deviled Easter Bunny Eggs in a few different variations: a Pesto version and a Roasted Piquillo Pepper version added green and red next to the yellow of the Classic Deviled Eggs. The three different colors really stand out on the platter. 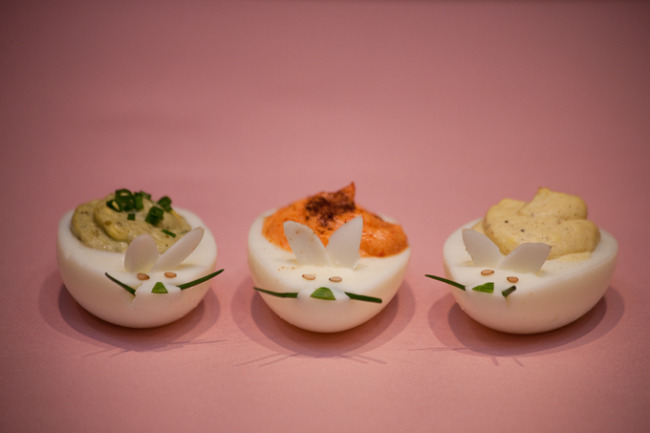 I saw photos of deviled eggs somewhere on the internet that looked like bunnies. They were so funny, they inspired us to do this but when I searched for them again, I couldn't find them anywhere. So, thanks mysterious egg decorator out there, we owe you a link. To make them into bunnies, slice a small piece of the egg white off the bottom. Do this before you fill them and that slice allows them to lie flat too. Cut the slice into two. Make three small incisions into the egg white, one about a quarter inch in front of the yolk space and two in front into the edge on either side of the pointy side of the white. Carefully insert the two slivers into the incision near the yolk space and a chive into each slot in the front. Make some eyes from sesame seeds. Lastly, place a small piece of chive in the very front for a nose. Have fun with decorating and get the kids involved! Give these a try in lieu of coloring eggs, they are much more delicious. In a mini food processor, puree peppers with mayonnaise until smooth. Add in egg yolks, paprika, salt and pepper and puree once more until combined. Pipe the filling into the empty egg whites, we used a plastic bag with the corner cut off. Garnish with more paprika. Combine all ingredients in a bowl and mix until smooth. Pipe the filling into the empty egg whites, we used a plastic bag with the corner cut off. Garnish with finely chopped chives. Combine all ingredients in a bowl and mix until smooth. Pipe the filling into the empty egg whites, we used a plastic bag with the corner cut off. Hi all, I had an office call looking for their free goods. It was a 1+1 on an SDR intro. Shelly wasn’t able to find anything on it. They purchased it in early February.